All my life, you were right there. But now you’re gone from my life forever. “Can’t you just come back to us?” I ask while staring down at your grave. Dad and Mom say it’s not my fault, but I still feel the guilt. Everyone knows I couldn’t have actually saved you, and that I might have ended up where you are now if I had tried. 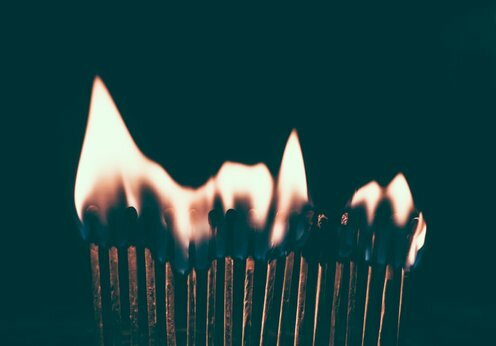 Fire is forever scarred into my brain, and I’ve hidden my pain from that night. Guess everyone is okay with the mask of clarity I pulled over my face. Hidden behind the mask is where my depression and mental breakdowns lay. I know there wasn’t any time, and it was so hard for them to get to you. John was in my arms; I made sure he was okay, but I was too young and scared to help get to you. Killing me on the inside, I just want my old life back, when you were there. Lying that I’m okay and that I didn’t want to come up to see you before they sealed your tomb. Maybe, just maybe, I just wanted to have the breathing you pictured in my mind instead of what I might’ve seen. Now I regret not coming up with him and seeing you because the years have taken your image away for my memories. Over and over again, I play back that night silently. Probably worsening my sadness, but it’s not all from the fire now. Quietly, I go back home from the cemetery alone. Right then, I find tears streaming down my face, but that’s normal when I think too much about things such as this. Screams forever echo in my memory; your screams for help and our father’s shouts for you. Tearing through the past, my thoughts sometimes go unyielding. Useless to talk about it to anyone now; it’s old news, I suppose. Very well, I am so sorry, and I wish I had more happy memories with you that I could remember. X-rays cannot spot the pain that I feel inside, but the pain is like a burning, bleeding sensation I wish hopelessly to go away soon. You know I love you, even though I was a pain to you while you were breathing. Zapping my mind to something new, I open my door and put a smile on my face. Jessie Silence says, "My inspiration I suppose you could say, was an old memory burning in the back of my head. When I was writing the words, it seemed as though I was not in charge of my fingers, I just let them write what I felt. I was surprised how easy it was to write this when I let my emotions go into my work. I hope that I wrote this piece well enough for the readers to catch at least a glimpse of emotion that I spilled into every word." Jessie is in 10th grade and attends Glidden-Ralston Junior-Senior High School.